At the beginning of the month it was assumed that Tyler Duffey would be enjoying crab cakes and Flying Dog with the rest of the Twins rotation when the season started in Baltimore. After all, manager Paul Molitor said that it would take something “fairly significant” to not have Duffey as one of his five starters. Whatever the reason -- because of his spring training results, inability to adapt quickly, or the progress of others -- Duffey’s rotation certainty has waned. If the Twins’ decision-makers are looking at the results, Wednesday did not help Duffey’s cause. 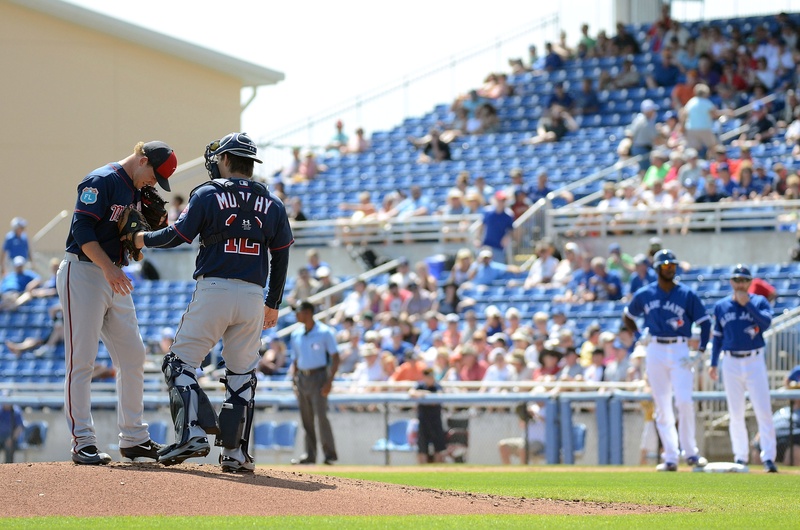 In a start against the Orioles' minor leaguers on the CenturyLink Sports Complex backfield (as chief competitor, Ricky Nolasco, prepared for his start at Hammond Stadium), Duffey failed to assert himself, allowing six runs spread over 5.2 innings on 90 pitches. Molitor, who had endorsed Duffey several weeks ago, watched several innings of what was an appearance marked with loud contact and inability to put hitters away on two-strike counts. The Orioles minor leaguers jumped on Duffey in the second inning, tagging him for a single, double and topped with a mammoth three-run shot to left-center as Molitor looked on. Duffey, who was around the zone for the most part, failed to get hitters to chase his curve ball out of the zone. Duffey’s curve was clearly his best weapon in 2015 and he leaned on it heavily. According to Fangraphs.com he threw it 39.8 percent of his mix, tied with Toronto’s Brett Cecil for highest usage. Naturally the word on the deuce is getting out. However, Duffey thinks he has the solution to combat opponents’ approach. Duffey has also worked diligently on his change-up this spring, a pitch he needs to put the finishing touches on. After throwing several into the dirt to Orioles hitters, Duffey said he made an adjustment to bring the pitch up some, only to do so at the wrong time. In the fourth, he hung a change to a hitter who launched a two-run shot to left-center. Duffey will likely get one more opportunity to show the Twins he can make his adjustments quicker and without so much barrel involved. Hitters have figured him out. That's the problem with trying to be a two pitch starter. It's one pitch or the other and once hitters see enough tape it's much easier to predict. That's why i think the Twins are insane leaving May in the bullpen. Guy has 4 legit pitches. Rediculous. here's what i think is going to happen, like it or not. Yeah, Duffey is making this more competitive than I was hoping. Seems like he needs to go to AAA to work on some more pitches. Let him go down to make his adjustments and bring him up when he's ready. There's enough depth for now to let him make mistakes in the minors and not have to cost games in the bigs. Sigh, you're probably right. I'm depressed just looking at that rotation. He's giving Ryan an out to start Nolasco and avoid conflict.I don't agree with it, but we all know how this will play out if Duff cannot get it together (if that hasn't just cemented it). Except it still is about the process. Nolasco had a great outing today. Does this all mean Nolasco is going to contend for Cy Young and Duffey will be a 9.00 ERA guy in the minors? Slowey used to dominate spring training, Buscher would outhit Barry Bonds and Morneau would bat below the Mendoza line. Its actually good that he sees guys sit on his curveball now so he can figure it out. Duffey was the right call late last season as his curve ball was dead on. This year, I'm not sure he should be the first guy called up if he indeed gets sent to AAA to start the season. IMO Berrios should get the first call, followed by Duffey. I agree it is a shame about May though he has had a rough spring as well. Really, So what? What third pitch did Blyleven have? As far as I could tell Radke had a fastball and a changeup. If his curveball has the same bite and his fastball has the same pop and his command sharpens I am not too worried. Felt good about the process is a cliche term that doesn't mean anything at all.That was the basis for the comment. He said he was missing with his fastball and apparently he hung a some curve balls.He has only two pitches, so I guess I don't understand what process he was happy about that led him to be missing both of them today. Reading the part about the plan of throwing more curveballs for strikes makes me think of hangers that end up a long way from home plate. Hopefully Duffey figures it out though, because he sure was fun to watch pitch last year. I imagine Trevor May standing out in the bullpen with a single tear running down his cheek. I have many tears on the other hand. I don't think "uneven" means what you think it means. He was bad, right? Why is it that Duffey puts up poor numbers in spring training and he is said to be "having a rough spring" and others who's numbers are not good are said to be "working on some pitches?" I don't care if Nolasco throws no hitters for the remainder of spring training. I still put May in the rotation and ask questions later. If anything, Duffey could help us in the pen. That's his native habitat. May has been a starter. It does seem odd, to me, that Duffey is the likely next starter up, and May is in the bullpen. I truly don't understand it. Doesn't fit the story line of "We can convert relievers to starters!" Duffey was the first success story. No chance they go back on that unless it's obvious it needs to be done. You could have safely predicted that in mid January, sans injuries. There really doesn't seem to be any other outcome. There were curveballs, and then there was Berts curveball. Maybe as good as there was in the history of baseball. In my book it wouldn't be May for Duffey. It would be May for Hughes. Hughes often relies on one pitch which works better out of the pen. My rotation would be Santana, Gibson, Milone, :Duffey and May. Nolasco in long relief and the #7 starter behind Berrios. Just my opinion. Duffey's was just as good in my opinion while he was up last year. He was buckling guys knees for called strikes and getting them to chase out of the zone. How much better can you get? I was a fan of Blylenven but just from the eyeball test Duffey's was as good or better last year. This isn't sacrilege. For a while Scotty Diamond's was really good also. Blyleven was special because he had a great curveball. He was HOF special because he had a great curveball for a really long time. Diamond's lasted one year. Duffey's lasted 10 games so far.. Ok, I really shouldn't have put Diamond in there because it wasn't on this level but wanted to to make the point that it was good and he couldn't maintain it. Duffeys's was great and we will see. Blyleven's was great and he maintained it. I don't want Nolasco in the rotation. I want Duffey as he's part of the future, and I want him part of the present as well. But if he's struggling and needs some time, and Nolasco is pitching well...which he seemingly has of late...this is not necessarily a bad thing. Any player or pitcher that goes out for the Twins and performs well is a good thing. It helps them win games. And it can also make a guy like Nolasco possibly tradable for when Duffey, or Berrios, is ready to come up. No need to find the closest bridge just yet. It should be noted that Nolasco was facing 100% minor leaguers because the Rays' plane from Havana was delayed. In my book, the real competition begins now, in the last couple weeks of spring training. Milone has solidified his position in the rotation, while Duffey has forfeited his edge (IMHO). Duffey certainly has a chance to claim the spot while Nolasco needs to sustain good performances. The decision was made to move May and they are not going to undo that because Duffey got knocked around by some minor leaguers. May did not look good in his outing late in today's game. I really like him and hope he's part of the rotation soon, but he isn't exactly making a strong case for himself lately. Maybe he can work on some things in the pen and be ready when he gets a shot. He was making a strong case before supposedly losing the competition. He has no case to make for himself now. The case is closed.